The 59th edition of the IATA Dangerous Goods Regulations (DGR) has introduced lithium battery segregation provisions for certain packages. This has been a result of our better understanding of the risks posed by one of the most common dangerous goods that are shipped worldwide. While some of these provisions will come into effect immediately together with the rest of the new provisions on January 1st, 2018, for others a transitional period has been devised. Lithium ion batteries (UN 3090) prepared in accordance with Section IA or Section IB of packing instruction 965. Lion metal batteries (UN 3480) prepared in accordance with Section IA or Section IB of packing instruction 968. These are the only dangerous goods from class 9 that have segregation requirements. 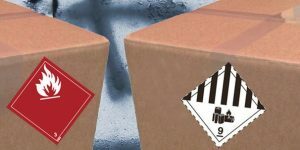 As per paragraph 9.3.2.1.3, they must be segregated from dangerous goods bearing a hazard label for Class 1 (other than Division 1.4S), Division 2.1, Class 2, Division 4.1 or Division 5.1. These new requirements are not becoming mandatory until January 1st 2019, but it is recommended that operators take steps to implement them as soon as possible. In these two cases, the new provisions come into effect on January 1st 2018; there is no transitional period. As our understanding of the risks posed by the transportation of lithium batteries, one of the most common dangerous goods shipper worldwide, grows, the dangerous goods regulations need to be adjusted.